Could Moving Help You Get a Green Card Faster? Location matters for getting a green card or citizenship faster—in some cases by more than half a year. U.S. Citizenship and Immigration Services (USCIS) recently published new data about wait times for two of the most important immigration forms: green card applications (Form I-485), and applications for U.S. citizenship (Form N-400). 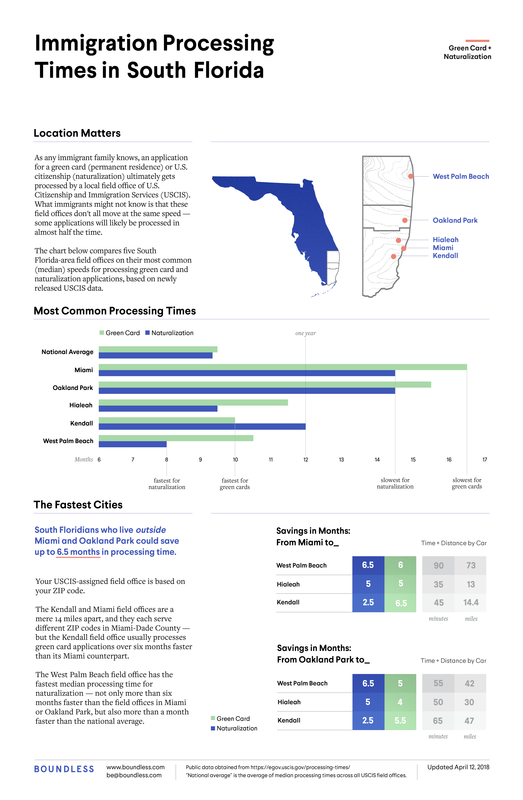 We analyzed this data and created an infographic to highlight the wide differences in application processing times across various USCIS field offices in South Florida. You can use this tool from USCIS to check wait times in your own location. Check current USCIS processing delays.